The weather in Beaverton lately has been very hot, last Friday I was really feeling like a cool summer drink to just wash away the busy work week. The first thing that came to mind was a fabulous drink we had in Vegas on our honeymoon; we had everything at home to make it other than the alcohol. When my husband came home we ran to our local liquor store for Rum and Tequila, these drinks only take moments to make and the flavor combination is over the top delish! Place into a blender the Pina Colada ingredients and blend until smooth and frothy, pour into a glass and fill about half way. 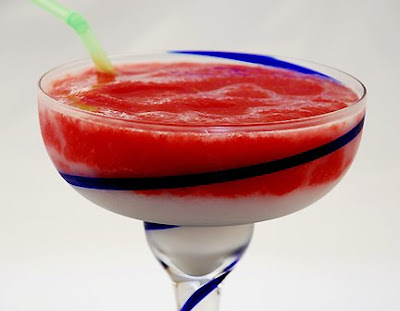 Rinse out the blender and place in the margarita ingredients and blend until smooth and frothy, pour on top of the Pina Colada and fill the glass. Insert a straw and site back with a cool and refreshing drink. YUM, would be good for the picnic on the 4th! Perfectly refreshing and such a pretty color. Pass me 2. Looks cool, refreshing and oh so tasty. Perfect for this hot 4th of July weekend coming up. That looks totally refreshing and we need refreshing in this heat! Yum yum!!!! My kind of drink and perfect for today! Both of these look perfect for a summer day! Two great drinks in one! What a genius idea. This looks delicious even at 8 a.m.